Acne scars cause an amazing amount of distress and Dr Renee regularly sees patients seeking solutions to this disfiguring scarring. 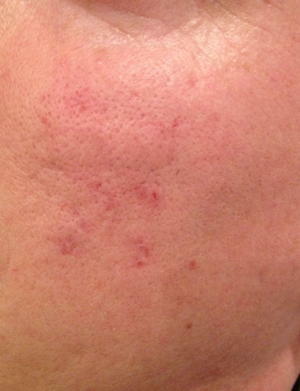 There are lots of potential solutions on the market to help acne scarring. The one solution Dr Renee has found really effective is fillers; either dermal fillers or skin boosters. Dermal fillers can be used to lift out deep sunken acne scars and improve the skin surface which has been disrupted by superficial scarring. Administering fillers into acne scars is a simple procedure which can be done in one sitting and the results are instant with improvement over the next few days as the needle marks heal and the fillers settle. Dr Renee is often able to carry out some subscision as she places the filler which can improve the scars permanently. The photos below are a real case that she carried out, before and after, using dermal fillers all taken in the same sitting. 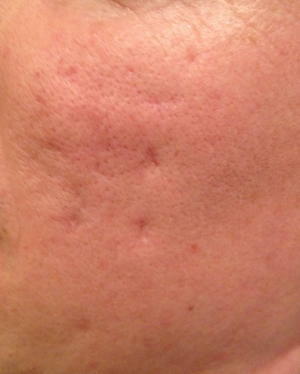 The needle marks and redness will all disappear within hours to days and the scars are almost invisible.